The recipe for these tasty dipping caramels came from a Farm Journal Homemade Candy cookbook I'd inherited from my mother. 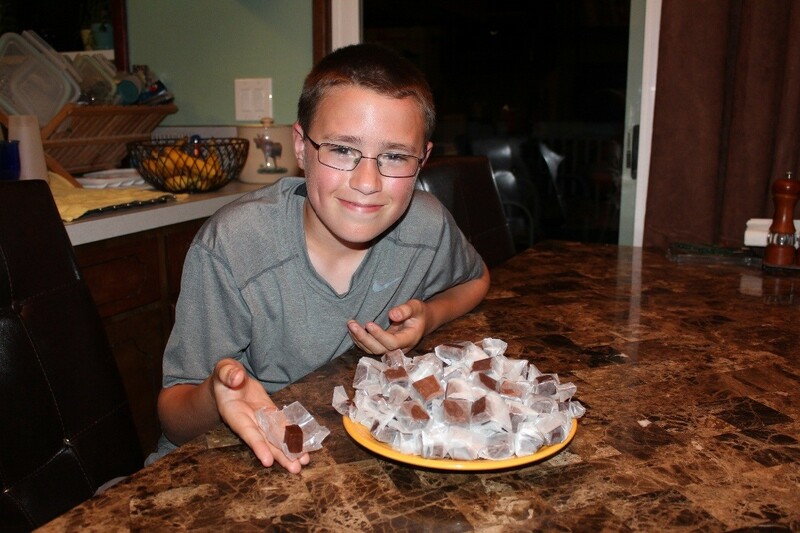 My 12 year-old son and I had a conversation about how you can make your own candy, so he went through this cookbook and picked this recipe for me to "help" him make. 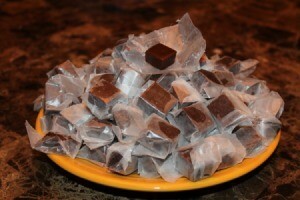 This made a TON of caramels and chocolate dipped caramels. We've been munching on them for the last three weeks :) My son is now planning to make candy for his friends for Christmas this year - a creative, frugal and, what I'm sure will be a very popular, Christmas gift. Combine sugar, corn syrup, salt and 2 cups cream in a 6-quart heavy saucepan. Bring to a boil, stirring constantly until sugar is dissolved. Slowly add remaining 2 cups cream, stirring constantly. Continuing stirring until the mixture reaches the soft ball stage (232 degrees F). This can take several hours! Slowly pour in the evaporated milk while continuing to stir mixture gently. Make sure the candy mixture never stops boiling as the evaporated milk is added. Add chocolates, and cook to the firm ball stage (248 degrees F). Remove from heat. Add vanilla and nuts. Pour half the candy into buttered 8 inch square pan (we recently broke our square pan, so we used two loaf pans - it worked fine). Pour the other half into a buttered 15 1/2 x 10 1/2 x 1 inch jelly roll pan (or tall sided cookie sheet). When cool and firm, cover candy in jelly roll pan with foil and place in refrigerator. These will be refrigerated for 2-3 days and used for dipping chocolate centers. Use a cool knife to cut the candy in the 8 inch square pan into 1 inch squares when firm (clean the knife and briefly place in the freezer if candy starts to stick to it). You will have 64 pieces. If you are not going to serve candy promptly, wrap each caramel in waxed paper and store (my son wrapped the caramels while I cut them). After candy in jelly roll pan has set for 2-3 days remove from refrigerator to a cool room in which you will do the dipping. Cut it into about 50 pieces in any desired shape. Place on waxed paper and let stand for 1 hour, or until it reaches room temperature. 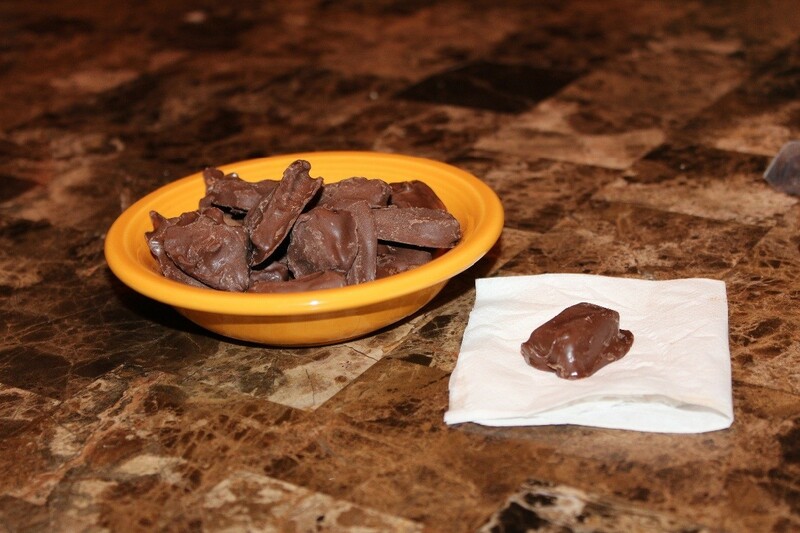 Melt chocolate confectioners coating or chocolates for dipping in double broiler. Dip centers in chocolate and place on waxed paper (another fun job for my son). Once dipped candies are cool, store in a Ziploc bag or airtight container. You can, of course, dip all the caramels or none of them. It's up to you. Both were quite tasty and very popular with all we shared them with, but use care if you have any loose fillings! My son really enjoyed this project. Try sprinkling each chocolate dipped with a little sea salt (my friend does this!) So yummy! I'll definitely have to try that - Sounds amazing! Yum. Why do I even try to diet? Lol Thanks, I know I will try it. It sounds yummy,but I can't see me standing at the stove,stirring constantly, for hours!